A chart marking the first anniversary of the stimulus package makes a case for the Obama administration’s effectiveness at saving jobs. It was exactly one year ago today that Barack Obama signed the $787 billion economic stimulus package, officially known as the American Recovery and Reinvestment Act, into law. With the unemployment rate hovering around 10 percent, the White House continues to battle public perception and Republican attacks that the stimulus plan has been ineffective in creating jobs, and it just released a report reiterating claims it made last month that 2 million jobs have been saved or created. Sometimes, however, a strong, simple infographic says more than words can. 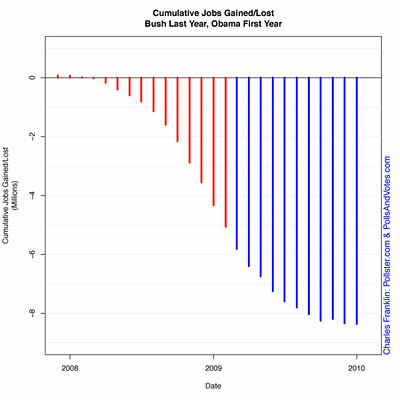 This nearly symmetrical, V-shaped chart (full size here) offers a powerful story about job losses which accelerated rapidly during the final year that George W. Bush held office and then slowed just as rapidly since the stimulus plan went into effect. In last month’s State of the Union, Obama was explicit in saying, “I inherited this mess.” The chart offers a visual reminder of how deep a hole we were in–nearly three-quarters of a million jobs lost a month when ARRA became law–and how far the country has come along the steep path to recovery since then. Whether the American people can be convinced remains to be seen, but graphics like this can only help make the case. Since first releasing this easy-to-understand infographic, the Obama administration has sent out a video explaining it, perhaps for the chart-challenged among us. Meanwhile, political science professor Charles Franklin has released a second infographic that presents the same data in a different way and elicits a different reaction; in the interests of fairness and objectivity, we bring you that one too. Rather than presenting job losses periodically, showing only the number of jobs lost each month, this one (full size here) shows them cumulatively, so that each month depicts total losses since the job market went sour. Instead of a V-shape, the story of jobs during Bush’s last year and Obama’s first becomes an inverted S. Here, it appears less that the Obama administration has dug us out of a “hole” and led us along the “steep path of recovery,” to use my own language above, and more that it has succeeded in stopping the bleeding and slowing the rate of attrition. 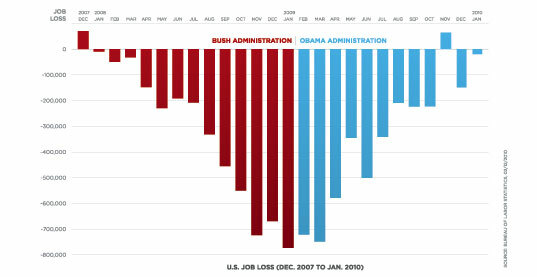 But while the narrative the Obama graphic puts forth may be slightly deceptive, so too is Franklin’s graphic–as he himself acknowledges–by making it appear that more jobs have been lost under Obama when in fact just the opposite is true. Taken together, these two charts, each with the same data but different biases in presenting that data, serve as a testament to the slipperiness and persuasive power of the infographic.